Kicking a nasty Diet Coke addiction. ** Though there can be some soda sales, coupons for Diet Coke are fairly rare. Most months, I’d go through 6 or 7 fridge packs, which clock in at around $4 each. In addition to being pretty pricey, it’s also pretty awful. At least it is for someone who can knock back four or five cans in one day on a weekend without thinking twice. Between my friends teasing me that my bones are made of phosphorous and this research (along with some cavity-filled dental visits to back it up), I decided to kick the habit once and for all. It’s not that I’ll never drink Diet Coke again. But it’s no longer a daily requirement. 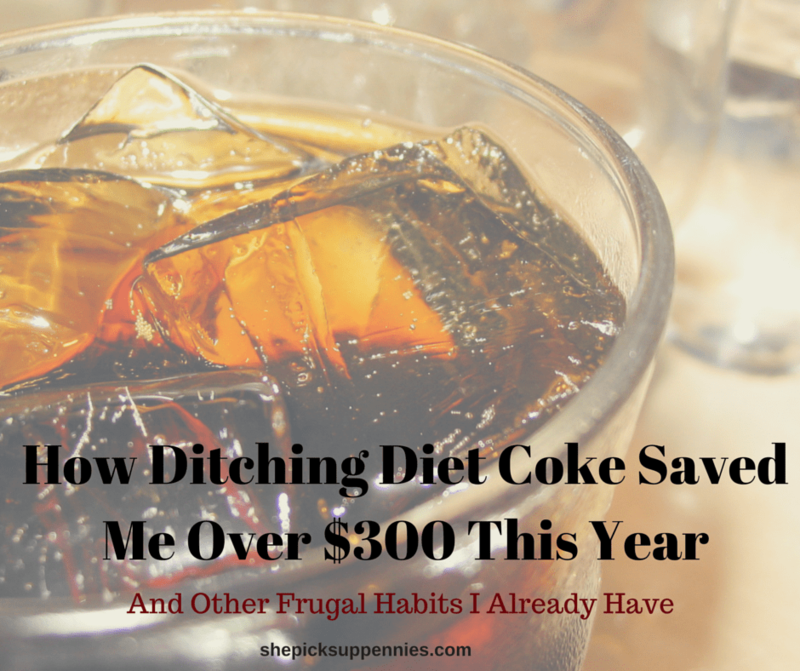 Plus, I figure by cutting back on popping those soda tops, I’m saving an easy $300 a year. Paying myself first. In addition to having nearly 10% of my salary diverted into my pension fund (the same goes for Mr. P), I always put a percentage of money towards savings and our emergency fund before I do anything else. My hope is that this blog will motivate me to increase that amount. Skipping Starbucks…and coffee altogether. I’m not a coffee drinker. I am a tea junky. Hot tea, iced tea, chai lattes, green tea ice cream – you name it, I probably love it. But between a Keurig (and a reusable k-cup filter) and a tea kettle, I’m pretty well set. Brown bagging it. I don’t go out to lunch. I just don’t. I always loved PB&J growing up, and I still do. Couponing, looking for sales, and shopping from lists. I do clip coupons on occasion to score some great deals and freebies, though I won’t spend five hours in one store while calling in the troops (read: any of my friends who were unlucky enough to answer my call) to stand in line next to me so I don’t break the “per person” rule at checkout. *** I also make it a habit to research my purchases, check sale ads, and make lists before I shop. Lest I be tempted to #buyallthethings at Target when I scoot past the clearance racks. *I love my husband. Really, I do. But I will never, ever, ever share a piece of floss with him. Ever. **If addiction sounds like hyperbole, I can assure you it is not. The headaches that plagued me for the first week sans Diet Coke were like nothing I’ve ever experienced. Not to mention the fact that I swear I can still discern between the refreshing pop-fizz sound of someone opening a can of Diet Coke and that of another inferior canned beverage. I.Was.Hooked. ***I’m looking at you, Extreme Couponing. Man, I swear I don’t hate on TLC. At least not all the time. Truth be told, I don’t even watch TLC for fear of it becoming Pandora’s box. Except instead of all the evils of the world popping out, Honey Boo Boo shows up at my doorstep. But watching the occasional YouTube clip is another story entirely. So tell me…What are some of your best saving habits? Do you love to hate these TLC shows, too? I haven’t quit diet coke altogether but I have cut way down. I started drinking tea in its place about half the time. The rest of the time, I drink water. The savings is nice, but I also enjoy not having to deal with a recycle 2-liters all the time. I’m with you on the tea, and I’m also trying to drink a lot more water. I’ll still have the occasional Diet Coke, but it’s not on my shopping list anymore. So many good reasons to switch. For me, the moment it was hard to give it up was the moment I realized I was probably overdoing it. So glad you stopped by! The latte effect 🙂 It’s really incredible how a few dollars here and a few dollars there can add up over time. Thanks for sharing your thoughts, Carmen! I’ve managed to limit my diet coke consumption to fast food restaurants and convenience stores. Thankfully, I don’t frequent either one more than one time per month. I figure $2-$3/month is a habit I’m willing to keep. I’m right there with you. It was truly so hard for me to kick the habit, I’m afraid if I drink it more than once a month or so, I’ll be right back where I was. Little indulgences here and there are great, though! Im not a big coke, coffee or tea drinker but my vice is definitely fruit juice. Im working on cutting down and making the switch to squash more as I know that cutting down will be better for our budget and my health. Juice is tricky, because it seems like it should be so healthy. But often times the juice I find myself reaching for is laden with sugar. Sounds like you’ve got a great plan. I would say my favorite frugal habits are my Netflix subscription and my library card. I stopped buying books and DVDs around the time my husband moved in with me in early 2009, and that has saved so much money. That’s a huge back pat. Isn’t it amazing how addicting it is? Hooray for Netflix and library cards. Free books make me happy! A kindred Diet Coke addict! I quit just over a month ago, and while I feel better, I still miss the ‘treat’ aspect of it… even though I didn’t really need a treat five or six times a day. I’m still looking for a frugal non-food treat substutute. I have a similar addiction to Pepsi Max (not sure if they sell that in USA… it’s sugar free pepsi, but tastes different to Diet Pepsi). It’s really bad. Any tips on kicking it? At first, I switched to other drinks. I drank a lot of iced teas or even sparkling water. That didn’t make it any cheaper, but it helped ease the pain some! Still, it’s one of the most challenging habits I’ve ever had to break. Good luck! Nice working kicking the Diet Coke habit! I found when I was cutting down on beer, switching to unflavoured soda water made it far easier than just going cold-turkey.